Although the trusses shown by Figs. 94 and 95 are known as bowstring trusses, the usual type of the bowstring truss is that shown by Fig. 96. In this truss all of the members except the upper chord are in tension, and the strains in the bracing are comparatively slight, thus making it a very economical truss for steel construction. 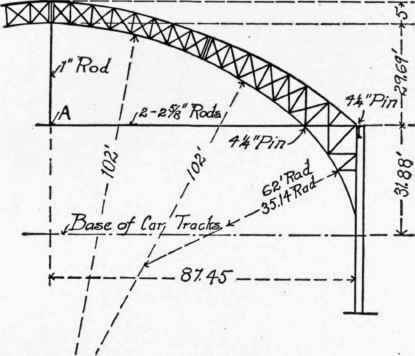 For trusses having a span of 75 feet or less the suspending pieces should be radials, but in trusses of larger spans they may be vertical, as in Fig. 97. Bowstring trusses of the form shown in Fig. 97 have been much used in England and to a considerable extent in this country. The upper chord is usually bent to the arc of a circle, with a rise in the centre of from one-fifth to one-third of the span. The depth of the truss in the centre should be about one-half of the rise. There are numerous examples of wrought iron bowstring roof trusses of from 120 to 211 feet span, principally in the roofs of train sheds. A truss of the shape shown in Fig. 97, with a span of 212 feet, a total rise of 40 feet 6 inches and a depth in the centre of 23 ft. 6 ins., was constructed with a 15-inch I-beam for the upper chord and a 4-inch round rod, in short lengths, for the lower chord. The diagonals were made of flat bars and the vertical pieces of cross-shaped bars to give stiffness to the truss, although these pieces are subject to a tensile strain. For a straight-pitch roof of moderate span there is no economy in using this type of truss, as the extra cost of the necessary framework above the truss for supporting the purlins will offset the saving in the truss itself. Of late years the bowstring truss has been but little used in this country, engineers and architects seeming to prefer the braced arch instead. The Crescent truss has been described in Section 25, Chapter I (Foundations On Firm Soils. Staking Out The Building). It is seldom used, except for the support of dome roofs, for which examples are given in Chapter V (Building Stones).